In times of digital music it´s getting more and more difficult to get vinyls. 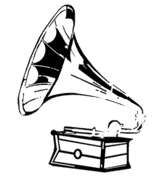 For all of you who still believe in the incredible sound of a „real“ record .... click on the grammophone - and we´ll forward you to our partner shop „Daily Records“. They have all these diamonds...waiting for you! Stay tuned!